Plan Downtown proposes removing or trenching many of the freeways that surround central Houston and implementing a 5-mile Green Loop of parks and trails. Image courtesy Downtown District. The plan reimagines downtown’s edges. 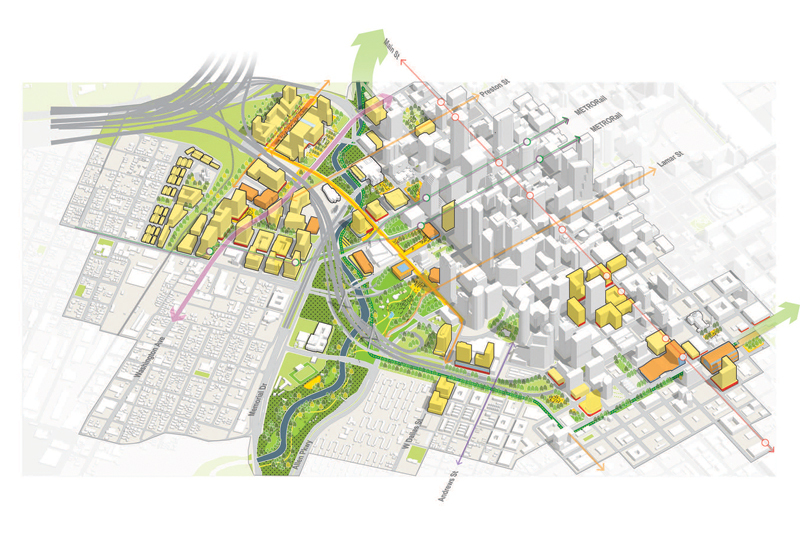 At the southwest edge, shown here, new connections are made to the Third and Fourth wards, a greenway runs along Pierce Street, and Buffalo Bayou is further integrated into the cityscape. Image courtesy Downtown District. Rendering of the vision for Bagby Street, rebuilt with better infrastructure for pedestrians, cyclists, and public transit. Image courtesy Downtown District. The plan proposes a canal along the northern edge of downtown that will address flooding. Image courtesy Downtown District. 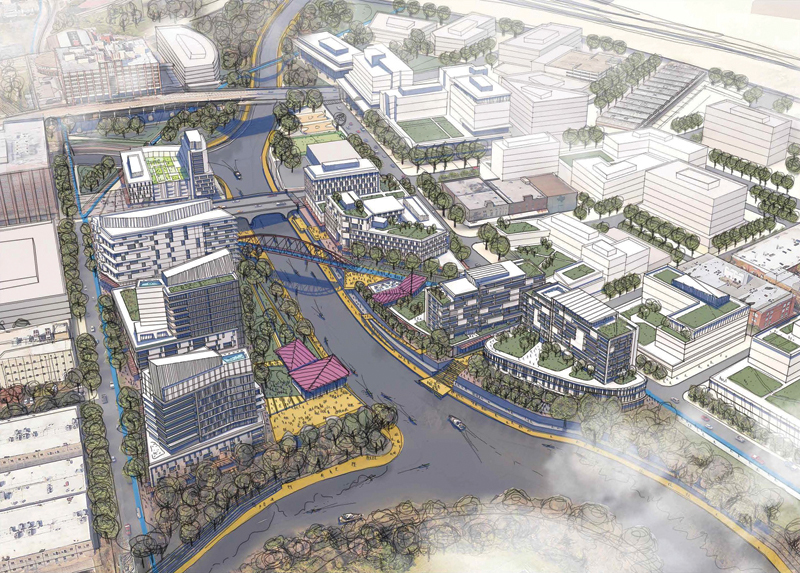 The Houston Downtown Management District, Asakura Robinson, and Sasaki have released an ambitious master plan in the wake of Hurricane Harvey. It proposes more than 140 ideas for the growth of America’s fourth largest city amid Herculean challenges. These challenges include disaster and flood mitigation, population growth, ecosystem balance and preservation, continued economic development, re-evaluation of housing stock, infrastructure reroutes, and technological advances, all while maintaining the city’s heritage and culture. 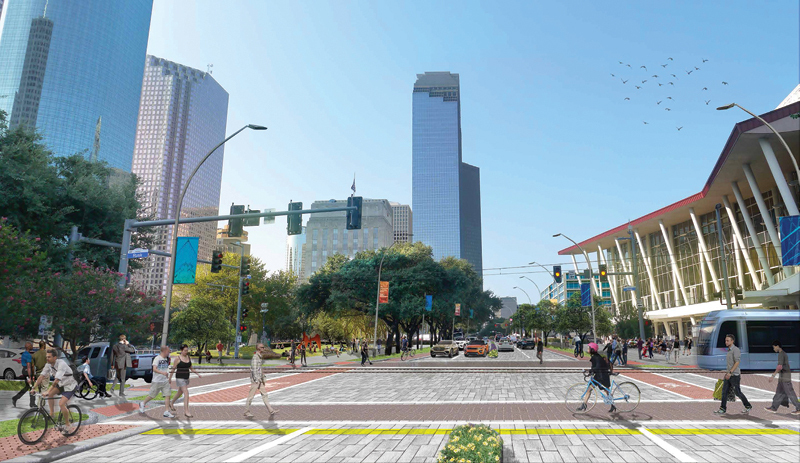 One of the major proposals is the Downtown Green Loop, where a mega-trail, park, and public space encircles the central business district and overlays the Texas Department of Transportation (TxDOT) North Houston Highway Improvement Project. The $7 billion infrastructure project, spanning 24 miles over a decade, includes realignment of Interstate 10. Parts of Highways 59 and 45 would converge in a trench on the east side of downtown, while a highway cap park would activate a direct connection from the George R. Brown Convention Center to the adjacent neighborhood. 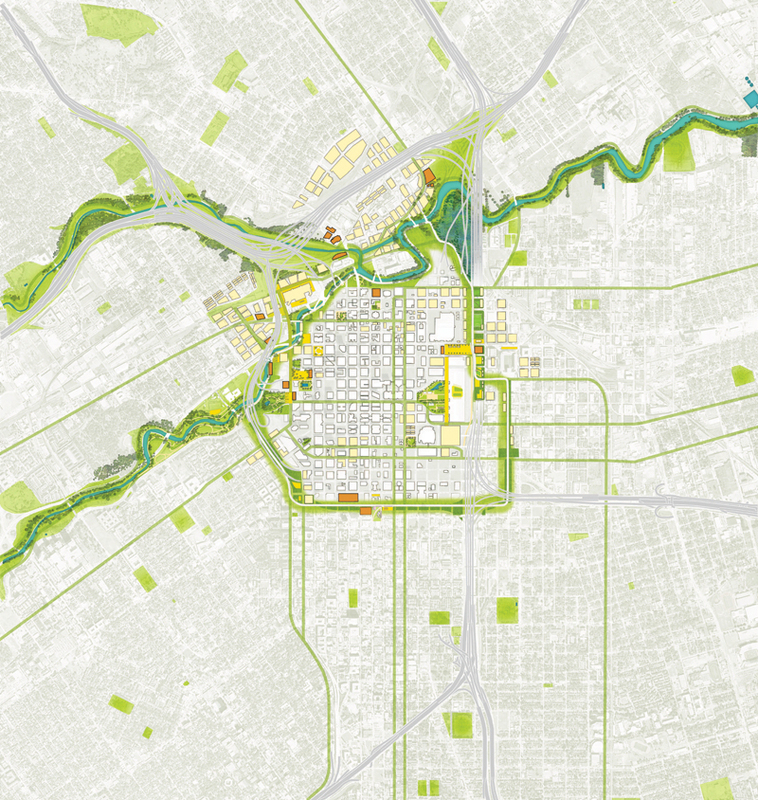 Conceptually, the Green Loop would connect the system of trails and public spaces at the trailhead of the Bayou Greenways project and address resilient edge conditions to absorb storm water and reduce flooding, engage Buffalo Bayou through landscape, and allow for building systems to be elevated and protected. TxDOT spokesperson Danny Perez confirmed that parts of the Segment 3 highway project around downtown are expected to proceed in 2020. These include reconstructing and widening I-69 South to 12 main lanes from I-45 South to Hwy 288 and reconstructing the I-69/Hwy 288 interchange (an estimated $173.5 million), reconstructing I-69 South to 10 main lanes from Hwy 288 to Spur 527 (an estimated $192 million), and constructing three I-69 gateway bridges at McGowen Street, Tuam Street, and Elgin Street in Midtown (an estimated $55.8 million). The fate of the Pierce Elevated — a congestion-prone section of I-45 that wraps the west edge of downtown — is still uncertain. Speculative plans have suggested demolishing it or saving it as a sky park. “We are agnostic, at Plan Downtown,” Hoogeboom says. “The financial feasibility and viability of the property owned by TxDOT has to be further evaluated.” Community input is also needed, despite some of the renderings depicting an at-grade linear park with some elevated portions preserved. The comprehensive plan includes a proposal of land transfer between METRO and the Harris County Flood Control District, to create an island and canal along the northern edge of downtown at the convergence of White Oak and Buffalo Bayou. If implemented, it could necessitate reworked street configurations and isolate the existing prisons downtown. The canal would address the powerful sheet flooding that was evident in the days after Harvey, as would pushing the the I-10 highway relocation to the north. Another connective artery in the plan would rethink the street network in terms of daily routines and engagement with technology as electric and driverless cars and subscription car services become more prevalent. Will aging garages be demolished for new building types, or will they be repurposed to temporarily house these fleets of cars? Will highways continue to overflow at peak times with private vehicles? How will mass transit be affected? Will existing METRO lines be used more efficiently, with all-day routes of commuter buses from points beyond the central business district operating to subtract daytime storage from the mobility equation? Hoogeboom says one project that will be actualized is the rebuilding of Bagby, a major downtown street, as a civic gateway from the western edge of downtown. As car technology is changing, so too is the need for innovative and repurposed tenant spaces to suit a rising workforce. Energy is the capital culture that supports innovation in Houston, and to promote that creative flow in a dense central district, the Downtown Plan recognizes the growth and diversification of the energy ecosystem by integrating core businesses with complementary industries to continue to attract talent. Mayor Turner cited housing as a number one priority, at the top of the list with resilient infrastructure and flood mitigation. The city is also prioritizing the creation of the “largest ever” volunteer program. Looking ahead to 2036, when Houston will celebrate its bicentennial, this plan examines the complexities of the networks converging and diverging on a precarious Gulf Coast floodplain. How will the eight counties surrounding this multi-centric metropolis evolve as its heart undergoes a transformation? Can the collision and comingling of urban and suburban sprawl with Houston’s wildcatter history make sense? and natural environment has begun. Florence Tang, Assoc. AIA, is a project manager at Kendall/Heaton Associates in Houston.